When getting started with Filestage, understanding the difference of Team Members and Reviewers can be tricky! 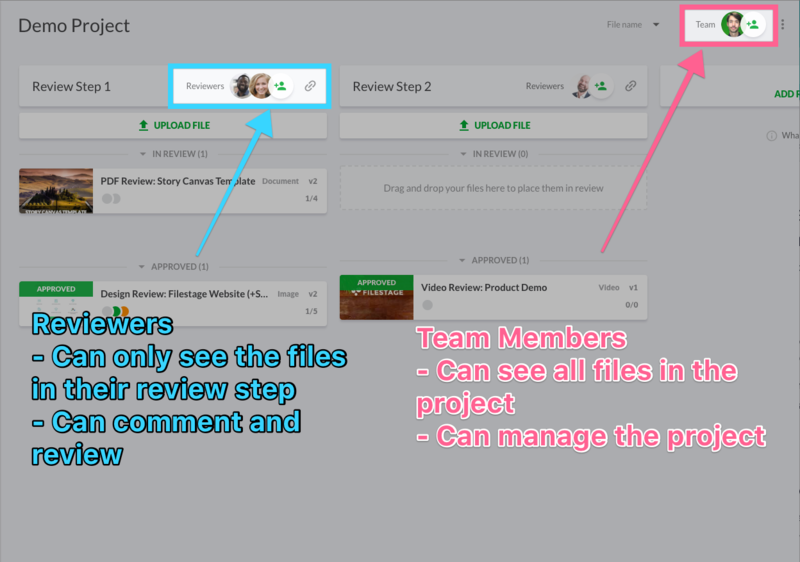 In a nutshell, reviewers can only access the files in their review step and can review those files while team members can access all files in a project and manage those files as well. Reviewers do not need to log in to access the files, but team member will need to log in to access the project. A reviewer is someone you invite to give feedback. This person can be a client, boss, co-worker, freelancer, or friend. Reviewers are able to see only the review step they were invited to. They do not have access to any other files in your project. Reviewers can access the all the files in a review step either via email invitation or a review link. More information about the permissions of reviewers and how to set them can be found here. A team member has a personal Filestage account and an individual project overview. Team members are able to create projects, upload files, and invite clients and co-workers to give feedback. To review a project as a team member, a team member must be invited to that particular project. Projects are private by default and you must invite team members to the project so they can view it and all the review steps, comments, versions, etc. You invite a team member to a project in the top right-hand corner.